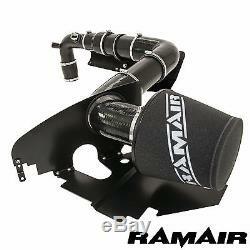 Ramair - air filter kit - large - induction / seat leon cupra / cupra r 2.0 tfsi. 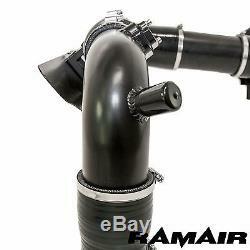 This very large filter kit (70 to 90 mm at the mass air flow meter) has an air inlet and a heat shield, as well as all the necessary components for the 2.0 tfsi transverse motor (ea113), in models k03 and k04. This kit was primarily developed for, and tested on, cars with the steering wheel on the right. For cars with a steering wheel on the left side, a small modification of the rear heat shield may be necessary in order to install the kit correctly. 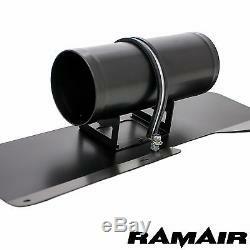 This kit increases the air flow and air intake noise compared to factory installed equipment. 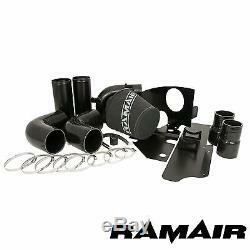 This kit replaces all factory-installed hoses, including the turbo manifold. Our heat shield is much more complex than the others available on the market and our filters are of the highest quality. The results observed industrially show that the gains obtained with our kits amount to 10% in terms of brake power, with a 25% greater air flow. Our kit also includes a heat shield for the collector, in addition to our unique thermal screen designed in two parts for the filter. Very large size (70 to 90 mm at the mass air flow meter). Comes with three main heat shields. Suitable for models k03 and k04. Includes all necessary nuts, screws and hooks. Update: assembly instructions in English. Up to 10% gains in brake power. Thermal screen cut with cnc laser. Cut with excellent laser technology, assembled with aeronautical-grade rivets and coated with a specially formulated satin coating with a black powder-coat finish. 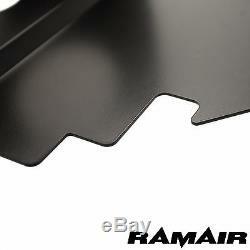 Ramair uses the same techniques for his premium motorsport equipment. Developed with the unique double-layer performance foam, a stainless steel support grid and a black satin trumpet whose flow is precisely optimized. Installation kit and detailed instructions. 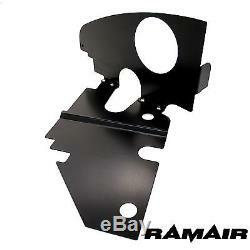 Each ramair installation kit uses high-quality components and double-checking to ensure that all the required items are delivered to you and that you simply have to install your item easily. With years of experience in induction technology, ramair's development team has ensured that this solution is right for your vehicle. In this area, their goal is perfection. This kit can be installed on a standard or already prepared vehicle; in either case, you can be sure that it will improve your performance. We are a UK registered company with a technical and commercial team available 5 days a week. We design, test, manufacture and assemble all our products in the UK. 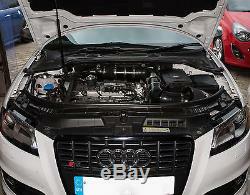 No less than 4 major car manufacturers trust us to produce quality filters for their city and racing cars. 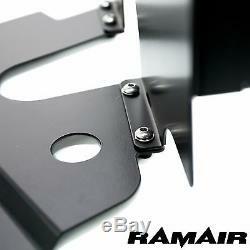 We try to offer shipping services in all possible countries. If your country of residence is not in our list, do not hesitate to contact us before ordering so that we can send you an estimate. In this case, we will contact you before sending your order. We make every effort to ensure that you are completely satisfied with your shopping experience. 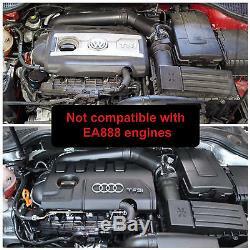 Do not hesitate to contact us in case of problem. Our goal is to have happy customers and 5-star ratings, so you can buy from us with our eyes closed. 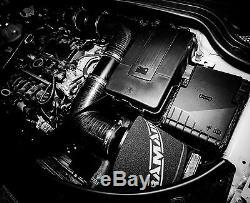 The item "ramair kit air filter large induction / seat leon cupra / cupra r 2.0 tfsi" is on sale since Wednesday, June 7, 2017. 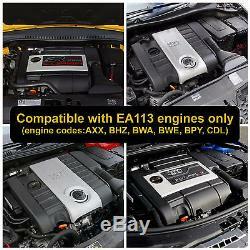 It is in the category "auto, motorcycle parts, accessories \ tuning, styling \ admission d 'air \ air filters'. 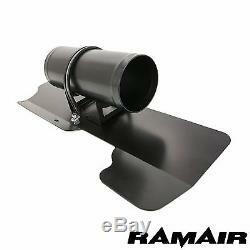 The seller is "ramair-filters" and is located in pewsey. This item can be delivered anywhere in the world.